Do you have a small kitchen and dream about a spacious one? The great news is that there are ways you can make your small kitchen really work for you and feel much bigger. Even a tiny kitchen can still be the heart of the home and a place where you’ll not only be able to function well, but that you’ll love to be in. 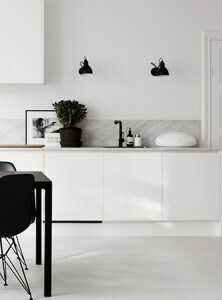 All you need is a little know-how and some clever surfaces to transform your small kitchen into a practical, functional area that looks and feels more spacious. Spaces look bigger when a mirror or high gloss surface is used. 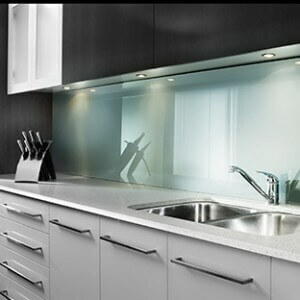 Consider Durallo splashbacks and SmartPanel cabinets, which are a practical and affordable solution for any kitchen. You can also use these kinds of surfaces to insert a pop of colour into an otherwise neutral kitchen. Consider installing cupboard doors and drawers with soft self-closing mechanisms. They are functional and will be more convenient for you and will make the kitchen look cleaner and bigger, even while you’re working in it. Light plays an enormous role in creating the illusion of space. Natural light, from a window or skylight, as well as well-elected artificial lighting can completely change the look and feel of any room and a small kitchen is no exception. Light in a kitchen should be bright and clear. Choose the right surface products for your kitchen like Wilsonart AEON laminate (which is scuff and scratch resistant) or Zenolite wall panels for your kitchen. With clever surfaces keeping them clean and looking great is easy. The key is cleaning as you go; don’t wait for dirt and grime to build up! Clean spills and smears as they happen and your kitchen will always look its best. When you apply these ideas to your small kitchen, it will be transformed from a place where you simply reheat takeaway food into a cosy place where you’ll love to cook, chat and spend time.